وجاء إلى كفرناحوم بحثًا عن يسوع. "الحاخام ، متى وصلت إلى هنا؟"
بل لأنك أكلت الأرغفة وشبعت. فَإِنَّهُ عَلَى اللَّهِ أَبَى اللهُ خَتْمَهُ. أجاب يسوع وقال لهم: "هذا عمل الله ، أنت تؤمن بالذي أرسله". So they said to him, “What sign can you do, that we may see and believe in you? أعطاهم خبزًا من السماء ليأكل ". لم يكن موسى هو الذي اعطى الخبز من السماء. أبي يعطيك الخبز الحقيقي من السماء. فقالوا له: "سيدي ، اعطنا هذا الخبز دائمًا". قال لهم يسوع انا خبز الحياة. وكل من يؤمن بي لن يعطش أبدا. Who here has ever walked into a kitchen and smelled something cooking and had their stomachs growl? 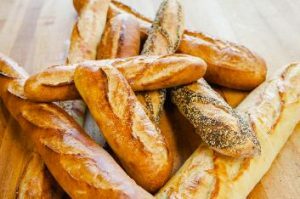 (ask what the kids smelled) The other day I walked outside my favorite local bakery, Bread & Cie, and the delicious smells almost pulled me inside! Who here has a favorite meal that they always love to eat? (ask the kids for their answers) In my case that is an easy answer……Lasagna. المعكرونة واسعة واسعة. بلدي صلصة محلية الصنع. جبن بارميزان وموزاريلا وريكوتا. الكثير من الشمر الإضافي ألقيت. طبقات من السبانخ الطازجة المطبوخة في. الرجل - يجعل فقط فمي المياه التفكير في ذلك. لذلك عندما نفكر في ما نسعى إليه ، فإن الإجابات الواضحة هي دائما طعام. كل بضع ساعات نريد أن نأكل شيء. If you are rich, you still get hungry at meal times. And I’ve read of people who are very, very poor, where hunger is described like an ache in their belly that never goes away. Regardless, hunger for food is a constant in each and everyone of your lives. And no matter how much we eat at any meal, it never lasts. We always long for more to eat. ولكن لأنك أكلت الأرغفة وتمتلئت. "قام يسوع بأداء معجزة التغذية لـ 5000 ، ليس لأن من المهم بالنسبة له توفير الطعام ، ولكن لأنه كان يعلم أن إطعامهم سيثير اهتمامهم. تماما مثل رائحة كنتاكي فرايد تشيكن أو من اللازانيا تجذب انتباهك ، أراد يسوع أن يلفت انتباهه لفترة كافية حتى يتمكن من تعليمهم عما يحتاجونه حقا في حياتهم. We should think of Jesus’ teachings a bit like this. Every lesson we learn about His word, we might have our spiritual hunger satisfied for a short time. Hopefully, after Church, you think about the teachings a bit and let it percolate in your brain. Hopefully – sometimes it gives you a few “ah-ha” moments where it brings you closer to a better understanding of your faith. But what Jesus wants is that we are hungry for His word the next time we go to church. And the next time we learn more about God. And the next. and the next. There is so much to learn from the Word of God, that we can never be filled. إذن ، ماذا نستنتج من هذه الجملة الأخيرة في ما قاله يسوع؟ "النهاية؛ أيا كان يأتي لي لن يجوع أبدا ، وكل من يؤمن بي لن يعطش أبدا. خلافا للجوع للطعام والجوع للتعلم ، يسوع يتحدث عن حفرة كبيرة in our lives. The hunger and the thirst in each of us that only the divine God can fill it. This hole is where we need God to dwell personally with us. This is where we hunger for meaning for our lives and thirst for a connection to something bigger than our lives. This something is God – Jesus, God in human form. He is the bread of life, whose sacrifice for our sins gives eternal meaning to our lives and provides us with a personal connection with the Father. Jesus is the answer to filling this emptiness that we hunger and thirst for. وكان هذا الدخول في خطبة اطفال. المرجعية الرابط الثابت.